Situated directly on the grounds of Treeline Golf Course, Dilla's is probably one of most testosterone friendly environments I have visited in quite a while. Where else can you play some golf with your buds and then throw down a greasy burger and not even have to get in your car? 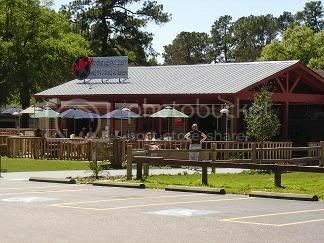 You could even meet your wife and kids there for dinner after playing golf as they have a sandbox for them to play in. It was plain to see that Dilla's certainly had the right environment... now it was time to give the burger a whirl. All in all - it wasn't bad. Wasn't the best, but not the worst either. Oh how I wish the picture below showed a white sheet of paper just covered with oooze. 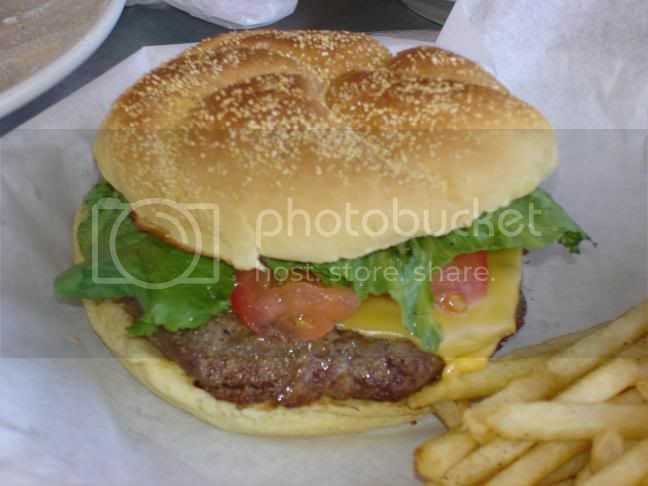 I wish your heart would just ache and heart doctors would write me nasty e-mails because of the terrible pictures I am posting on my site... but alas... the Dilla's Big Burger is not a pile of oooze. It is just a plain ol' cheeseburger with not a lot happening in the way of oooze. Don't get me wrong - it isn't dry - it actually has a little shine to it - but the Dilla's Big Burger just isn't a heavily ooozy burger. Seeing as how I ordered the Big Burger, I was hoping it would be rolled out with a dolly. When that didn't happen, I had to settle for what they sent me. It wasn't small by any means, but it was not a heavy herd killer either. If you are at Dilla's and looking to kill a cow or two, order yourself the Bigger Burger. It is the double patty version of the Big Burger. I'd say that would be about enough burger to fill most people up quite nicely. Overall the Big Burger had good flavor, but no herd of cattle were killed for this burger. This burger is probably a 1 1/2 hander burger. It is not a 1 hander by any means, but it isn't so big that you need help from your friend to cram it into your face either. 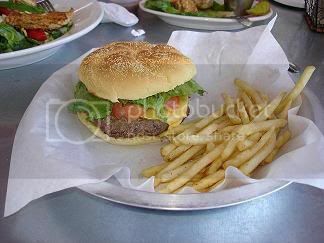 :) Again, if it is a 2 handed burger you desire... order the Bigger Burger cause well... its bigger. Overall, not bad, but not huge. The Big Burger comes with fries. (as shown above) The basket is $5.25. I left Dilla's full, although not feeling completely stuffed. I could have crammed in another handful of fries and maybe a second patty. I am spoiled because I have been to places like Christian's Totem where you can get a herd killer deluxe burger for about 3 bucks. I thought the Big Burger was not overpriced, but pretty close. 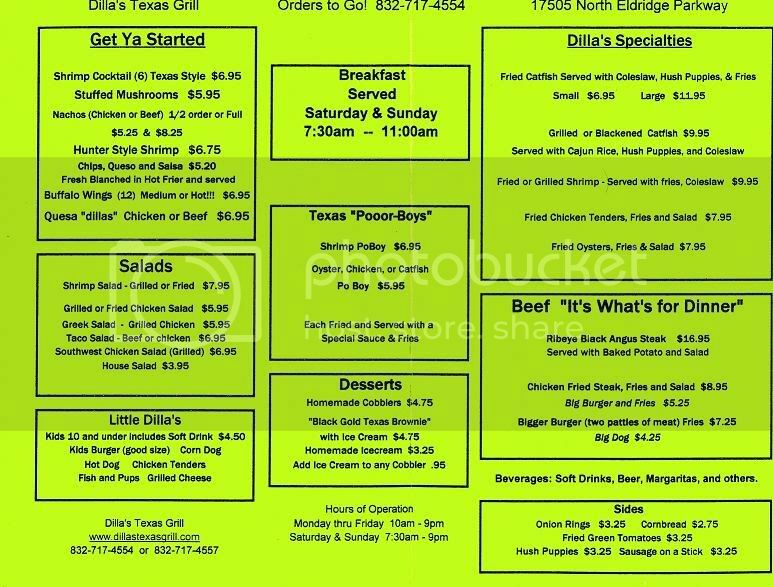 Dilla's menu offers a pretty good variety of food ranging from fried catfish to burgers to steak. 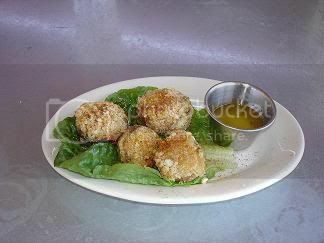 They have a pretty mean appetizer in the stuffed mushrooms (see picture below). My goodness gracious those babies were awesome!!! There were actually 5 on the plate when they came out but I couldn't help myself before taking the picture. Anyway.. the food was good. As I said before, the burger didn't set me on fire, but that isn't to say it was terrible either... I have had a LOT of burgers so I guess my standard is pretty high by now. 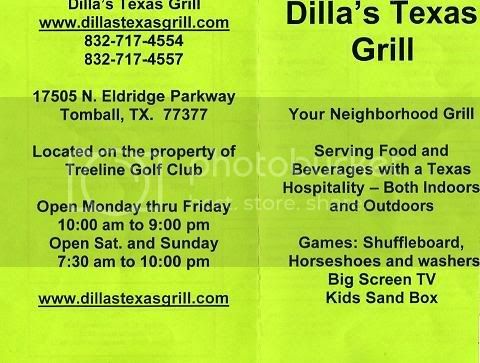 Dilla's is located at right next to Treeline Golf Club in northwest Houston. If you're going north or south on Highway 249 - just exit at Spring Cypress Road, go one mile west to Eldridge (stop light) and turn right. The restaurant will be on the left. Dilla's has a great atmosphere. You simply can't beat sitting out on the deck on a perfect spring day. The food is pretty good. The staff is awesome. I will be back to visit Dilla's again mainly for the atmosphere... and it is on the golf course I frequent. The last time my wife played in the sandbox, the cat tried to bury her. 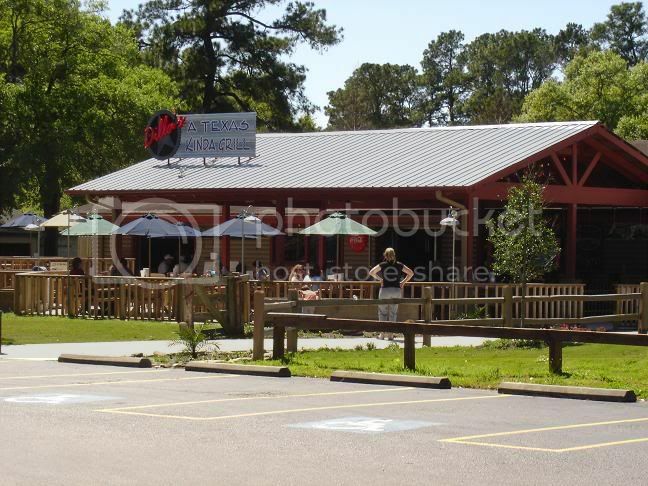 Great atmosphere, good food (especially the shrimp po boy). Wish they had music Friday and Saturday evenings. Need to hear "Nate." He'd be perfect for the setting. Family ate and listened to the band "Cold Creek" and it was an enchanting evening. We all stayed longer and drank more because of the atmosphere created by the live music (which "fit" the occasion with lots of cover songs). We'll be back when the band plays again.